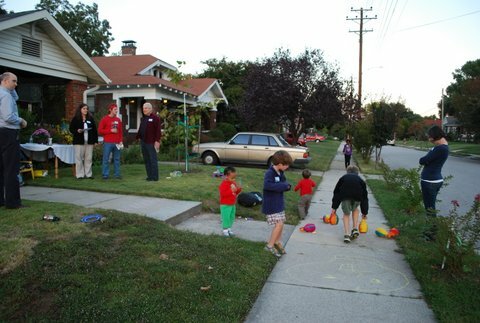 An event designed to foster community connection and help neighbors meet and look out for one another hit the Cooper-Young neighborhood with parties going on all across the tight-knit community. The annual Cooper-Young Neighborhood Night Out brings people together in an attempt to lower crime by having residents hang out and get to know each other. This encourages neighbors to look out for one another as one friend might do for another. The event mirrors the National Night Out typically held in August. Cooper-Young chooses to hold it's night out in October to avoid intense Memphis summer temperatures. Eleven different parties were held and ranged from small gatherings with a few people to more than twenty people. 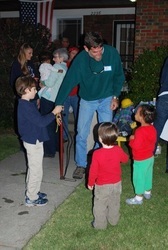 Patrick Miller attended one of the parties on Nelson Avenue. "It is important to make people understand that this is a safe neighborhood," he said. We have kids and families and this shows people that this is a safe part of town. In addition to being a resident of Cooper-Young, Miller also works with the Cooper-Young Community Association and serves as chair of the communication committee for the community. "This is a great freaking place to live," Miller said. "I think this is why the (American Planning Association) named Cooper-Young as a top-ten neighborhood." 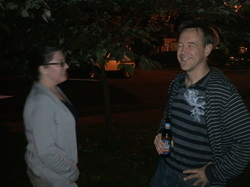 Kristan Huntley also attended the house party on Nelson Avenue. She said the event was the perfect way for neighbors to get together and form lasting bonds. "It's a great way to get out and meet your neighbors," she said. Huntley is the community director for the Cooper-Young Community Association. She said residents in the community do a great job of helping others out. "We watch out for each other," she said. "Everybody watches out for everyone." Huntley said residents often come together when crime hits the community. There was a string of petty thefts that took place on Elzey Avenue earlier this year where thieves were stealing property from porches and yards. The neighbors got tired of this and came together and formed a watch group and the thefts stopped. Day or night, Huntley said she feels safe in Cooper-Young. "You have people coming and going at all hours," she said. "There is never really a time when I feel no one is around." Steve Lockwood, a longtime resident of Cooper-Young said that some crime is to be expected in any community, especially one as eclectic as Cooper-Young. "Anytime you have a nightlife scene like we have, you will get predators," he said. Compared to other communities, Lockwood said Cooper-Young does very well with public safety. "I've lived here 35 years and have only had one burglary," he said. Laura Harris held a party on Evelyn Avenue during the event and said she built new relationships she did not have before. "We got to know some of the people on our street that we didn't know before," she said. Nancy Wiers, who was at the party on Evelyn Avenue, said the event helped build stronger community ties. "We care about our block and our neighborhood," she said. For more information on Cooper-Young being named a top neighborhood in the country, see the Commercial Appeal article here. 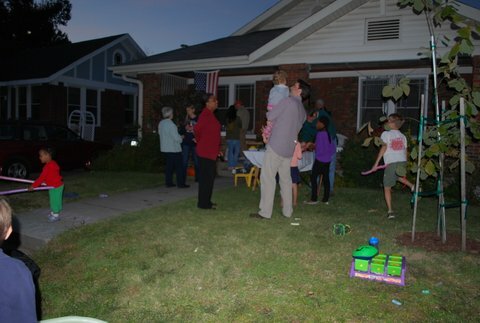 Click here to read more about why the Neighborhood Night Out is important to Cooper-Young residents. The three pictures below are all courtesy of Nancy Wiers. Dustin Azlin covers public safety for MicroMemphis. You can follow him on Twitter @DustinAzlin.